The bragging rights to carry the Shuttle on its back came down to the Air Force’s C-5 and Boeing’s 747. The C-5 was a potential budget buster for NASA. It was a large and expensive aircraft that entered production in 1968. The initial version of the aircraft had developed problems with cracks in the wings and it appeared that at least in the near term were likely to suffer a higher rate of fatigue. The aircraft also had a high wing design and a large T-tail which while not enormous drawbacks could have proved problematic. It should be noted that the Soviet Space Shuttle Buran successfully rode atop the high wing AN-225. 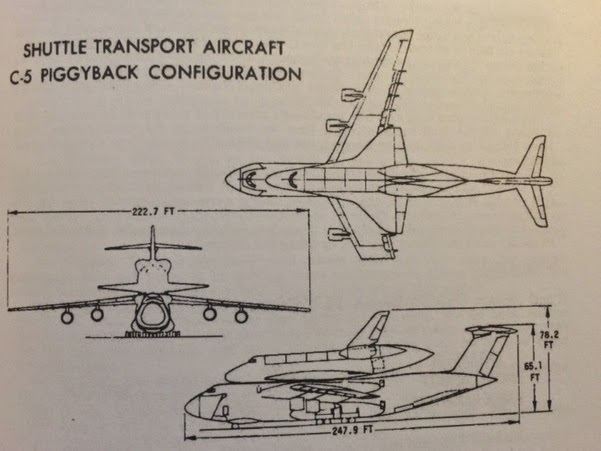 The AN-225 has similar features to the C-5, but varied in design of the vertical stabilizer. While the C-5’s job was to haul heavy cargo, given the expense it was overkill for what NASA needed. It would be a combination of factors that would ground the C-5 from consideration and push the 747 to the forefront. The availability, acquisition, operating, and maintenance costs of the C-5 were too big an obstacle for NASA to overcome. On June 17, 1974, less than a year after NASA signed the contract to put jet engines on the Orbiter for ferry and atmospheric testing flights, the debate was settled. In a press release NASA announced that Boeing 747 would now get the call and become the Shuttle’s chauffeur when it needed a ride. Solving the problem of how to ferry the shuttle was perhaps a foreboding sign of how challenging getting the Space Shuttle off the ground would turn out to be. In less than a year, the Orbiter went from having jet engines installed between missions to ferry itself to riding on atop a 747. Now, all NASA needed to do was find a bargain priced 747 and make sure the modifications to the aircraft could be made and that the plan would work. In that same year, NASA acquired a used 747 from American Airlines for $16 million. The aircraft, built in 1970 for passenger service, would become NASA 905 with tail number N905NA. It was put to work immediately as part of a study to understand the effect of wing vortices on trailing aircraft. In 1976, it was sent to Boeing to undergo modifications in preparation to carry the shuttle on the first approach and landing tests. The modifications included stripping the interior to reduce weight, adding the Orbiter’s attach points and strengthening the fuselage. Its only job would be to carry the spacecraft anytime it needed to move from west to east, or on its last flights take the Orbiters home to their final resting place. In 1998, NASA acquired a second used 747 from Japan Airlines, It would become N911NA. In 1977, Enterprise was became the only shuttle to ever ride the 747 and then get released into the air to glide to a landing. That test proved that the Orbiter could safely function as a glider and did not need the support of jet engines. The rest of the shuttle fleet hitched a ride from the Rockwell factory in Downey, California, from landings at Edwards Air Force Base, and once from the White Sands Missile Range. The use of the 747 would add a measure of safety to transporting the Obiter, but was not without limits. NASA originally projected that the pair would have a range of 2320 nautical miles. That would be sufficient to make the cross country trip non-stop. It would turn out that the mated 747 and Orbiter had a range of about 1000 nautical miles and a ceiling of 15,000ft. 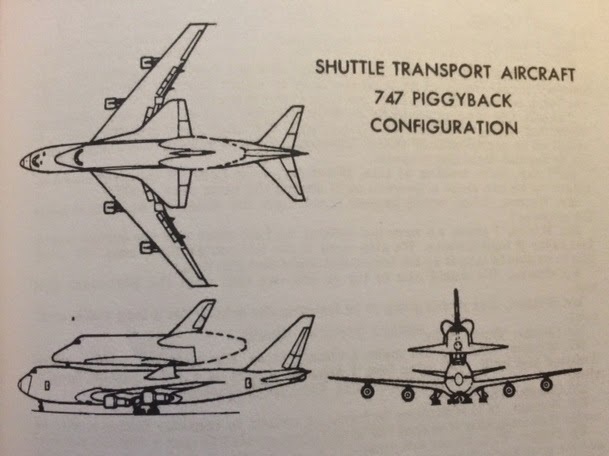 The range was double the jet engine concept's performance, but less that half of what was needed to fly coast to coast without a stop for refueling.There would be a speed limit imposed on the 747 when the shuttle was riding along and reminders for the crew not to exceed a maximum of 250 knots. Any time the shuttle was being ferried the route was carefully planned to avoid weather and allow for contingencies in the event of an onboard emergency. When mated to the Orbiter, the Shuttle Carrier Aircraft was always preceded by an advance scout plane flying approximately 100 miles ahead to check for adverse weather conditions and turbulence. A transatlantic abort never occurred in the shuttle program, but it would have been a challenge for NASA. When Enterprise went on a European tour to England, Germany, Italy, and then to Canada it would prove that the 747 could carry an Orbiter back from an overseas trip. A typical route might take the pair from continental Europe to England, then on to Iceland, then Canada, and finally to the United States. However, the Enterprise was not a "fully weighted" shuttle and even with this lighter load the mated ships would require several stops on a planned route to make it back. In the event of an operational shuttle aborting to a European landing site the shuttle would have to undergo modifications prior to being mated to the Shuttle Carrier Aircraft. This would have meant taking everything possible from the payload bay. The removal of cargo, the robotic arm, or any extra components that would reduce the weight of the shuttle and increase the range of the 747. A mate-demate scaffolding like structure was built to lift the Orbiter on to the back of the 747. These mate-demate structures we housed at the Kennedy Space Center and Armstrong Flight Research Center (formerly Dryden). Only one time in the operation phase of the program were the devices not used. That occurred on STS-3 when Columbia landed at the White Sands Test Facility, Special equipment was shipped by train to the site to lift the Orbiter on to the 747. It would not be used again until the flight ferry flights of Discovery, Endeavour, and Enterprise to museums in Virginia, California, and New York. The older NASA 905 would be the workhorse from start to finish. The newer NASA 911 would retire early and NASA 905 would take finish the job it started three decades earlier without a hitch giving the Orbiters one last ride. The Space Shuttle Orbiter sitting atop a Boeing 747 was a memorable sight. Its last trip made a lasting impression as it performed flybys to crowds in cities like Houston, Austin, Washington, and New York that were awed by the sight of these two historic feats of engineering that were dependent on each other. Starting with the very first space shuttle, Enterprise to the last shuttle Endeavour, every Orbiter needed the Boeing 747 Shuttle Carrier Aircraft (SCA) to go anywhere but space. After more that 30 years of service their work was done. With nowhere left to fly the Shuttle Carrier Aircraft NASA 905 joins the Orbiters in the history books and will now go on display at the Johnson Space Center in Houston, Texas. Figuring out how to ferry a Space Shuttle got off to a rough start, but in the end it turned out to just turned out to be all in a day's work for the Boeing 747. Altitude: Typical cruise with orbiter, 13,000-15,000 ft; typical cruise unmated, 24,000-26,000 ft.